"Why are you crying?" a young naujawan asked his mom. Later the little boy asked his daddy, "Why does mother seem to cry for no reason?" The little boy grew up and became a man, still wondering why women cry. Finally he put in a call to WAHEGURU JI; when He got on the phone, the man asked "O WAHEGURU JI, why do women cry so easily?" When I made women she had to be special. I made her shoulders strong enough to carry the weight of the world; yet, gentle enough to give comfort. I gave her a hardness that allows her to keep going when everyone gives up and take care of her family through sickness and fatigue without complaining. This same sensitivity helps her make a child's booboo feel better and shares in their teenagers anxieties and fears. I gave her strength to carry her husband through his faults and fashioned her to protect his heart. I also gave her a tear to shed, It's hers exclusively to use whenever it is needed. It's not her weakness, it is her strength. It's a tear for mankind. The beauty of a woman is not in the clothes she wears, the figure that she carries, or the way she combs her hair. The beauty of a woman must be seen in her eyes, because that is the doorway to her heart, the place where love resides. True beauty in a woman is reflected in her soul. It is the caring that she lovingly gives the passion that she shows and the beauty of a woman, with passing years, only grows! Womanhood is the strength of the Panth. She bears our future generations. She nurtures them because she spends more time with the young. 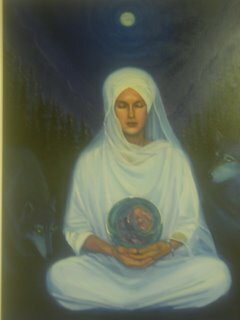 She can help Sikhi to flourish or she can bring about its demise. Sikhi is the future for mankind and 'she' is its most important tool for the future. Nanak said so over 500 years ago. 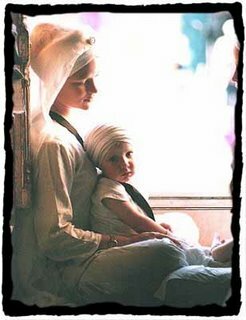 Let us now practice giving women their rightful place in Sikhi. I was just wondering could you please post a larger version of that last picture? Sorry, I don't have a larger version of that picture. I don't remeber where I got the picture from. I know it was the internet, but don't remeber what site.